Those black eyes, cold as a winter storm, were staring right into her heart and the sudden seriousness in his voice jolted her. To be greeted with stares and whispers, to suffer violence and insult on the street, to see mistrust and fear in every eye: this is the lot of the tiefling. And to twist the knife, tieflings know that this is because a pact struck generations ago infused the essence of Asmodeus—overlord of the Nine Hells—into their bloodline. Their appearance and their nature are not their fault but the result of an ancient sin, for which they and their children and their children’s children will always be held accountable. Tieflings are derived from human bloodlines, and in the broadest possible sense, they still look human. However, their infernal heritage has left a clear imprint on their appearance. Tieflings have large horns that take any of a variety of shapes: some have curling horns like a ram, others have straight and tall horns like a gazelle’s, and some spiral upward like an antelopes’ horns. They have thick tails, four to five feet long, which lash or coil around their legs when they get upset or nervous. Their canine teeth are sharply pointed, and their eyes are solid colors—black, red, white, silver, or gold—with no visible sclera or pupil. Their skin tones cover the full range of human coloration, but also include various shades of red. Their hair, cascading down from behind their horns, is usually dark, from black or brown to dark red, blue, or purple. 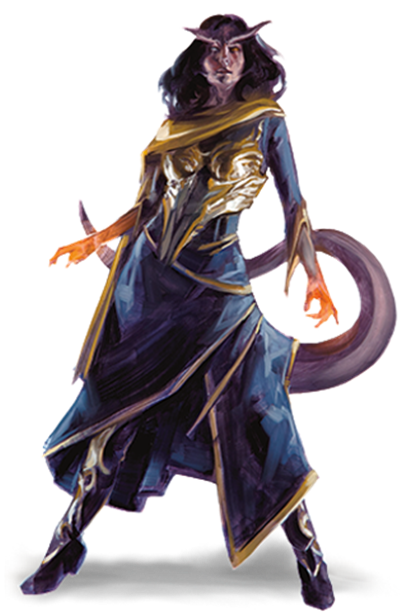 Tieflings subsist in small minorities found mostly in human cities or towns, often in the roughest quarters of those places, where they grow up to be swindlers, thieves, or crime lords. Sometimes they live among other minority populations in enclaves where they are treated with more respect. Lacking a homeland, tieflings know that they have to make their own way in the world and that they have to be strong to survive. They are not quick to trust anyone who claims to be a friend, but when a tiefling’s companions demonstrate that they trust him or her, the tiefling learns to extend the same trust to them. And once a tiefling gives someone loyalty, the tiefling is a firm friend or ally for life. Tiefling names fall into three broad categories. Tieflings born into another culture typically have names reflective of that culture. Some have names derived from the Infernal language, passed down through generations, that reflect their fiendish heritage. And some younger tieflings, striving to find a place in the world, adopt a name that signifies a virtue or other concept and then try to embody that concept. For some, the chosen name is a noble quest. For others, it’s a grim destiny. People tend to be suspicious of tieflings, assuming that their infernal heritage has left its mark on their personality and morality, not just their appearance. Shopkeepers keep a close eye on their goods when tieflings enter their stores, the town watch might follow a tiefling around for a while, and demagogues blame tieflings for strange happenings. The reality, though, is that a tiefling’s bloodline doesn’t affect his or her personality to any great degree. Years of dealing with mistrust does leave its mark on most tieflings, and they respond to it in different ways. Some choose to live up to the wicked stereotype, but others are virtuous. Most are simply very aware of how people respond to them. After dealing with this mistrust throughout youth, a tiefling often develops the ability to overcome prejudice through charm or intimidation. Your Intelligence score increases by 1, and your Charisma score increases by 2. Tieflings mature at the same rate as humans but live a few years longer. Tieflings might not have an innate tendency toward evil, but many of them end up there. Evil or not, an independent nature inclines many tieflings toward a chaotic alignment. Tieflings are about the same size and build as humans. Your size is Medium. Thanks to your infernal heritage, you have superior vision in dark and dim conditions. You can see in dim light within 60 feet of you as if it were bright light, and in darkness as if it were dim light. You can’t discern color in darkness, only shades of gray. You can speak, read, and write Common and Infernal. This is my favorite race. I don’t know why. It's now under it's own, separate race. Yeah i saw yesterday while making my wifes character XD. Thanks though. Love the new Variants of the Tiefling, but how about some love for the Aasimar? Maybe based on the Seven Heavens of Mount Celestia as a nice counter to the Nine Hells. Is it possible for a tiefling to become a vampire? Are there any rules for Tiefling tails? In 4th there was somes Traits you could take for that, like having your tail be dextrous enough to retrieve or stow away items from your inventory, and other stuff, but nothing really major, like a tail attack or trying to make an opponent fall prone or something, wich is kinda sad. Thanks, I was looking for a way to do a type of 3 weapon fighting hand, hand tail. My idea was depending on how the tails were designed whether like a nightcrawler snaking point or more like a thick lizard cone shape. I would do it like two hand fighting where u drop the Prof. bonus on the attack damage. can you please add SubRaces! i know that a Tiefling is part human but whats the other part?